Since 2008, we have been serving the residents of Staten Island and of New York City at our office located at 1428 Victory Blvd, in the Sunnyside community. injury, or surgery can be debilitating and our goal is to help you regain your strength so that you can resume your everyday activities. Our staff takes professional and supportive measures to make sure your physical rehabilitation process is a positive experience. 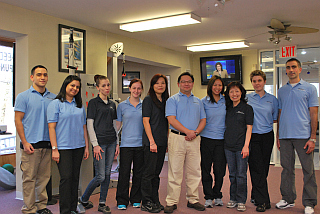 Most of our highly trained physical therapists possess master or doctorate degrees and provide premiere health care. Our treatment plans are customized to address the needs of each patient and our patients usually make progress on each visit to our facility. Our staff has the expertise and skill to treat all your physical therapy needs, including treatment for pre and post operative therapy, imbalance, degenerative changes, lower back pain, trauma, dizziness, chronic pain and headache. TLC Clove Lake Physical Therapy's commitment to our patients is to provide the highest quality service, to promote and to facilitate wellness through clinical service and education, and to be attentive to your concerns or questions about treatment. In a safe and comfortable environment, we make every effort during treatment to minimize any patient suffering. Our ultimate goal is for the patient to regain his/her maximum strength and ability. Please feel free to inquire about coverage,plans with our office. U.S. Family Health Plan; Wellcare and Workers Compensation and etc. We are open six days a week. Fornyour convenience, our facility has evening and Saturday hours appointments.